For many the Alpackaraft is the original and definitive packraft. Designed and made in Colorado, US their first packraft was designed for a backcountry trip into the Brooks range, Alaska. My own packraft is an Alpackraft Yukon Yak – the medium size of their classic all-purpose packraft. Recent years have seen smaller light versions such as the CuriYak and Scout, and more recently burlier white-water variants including the Alpackalyse. 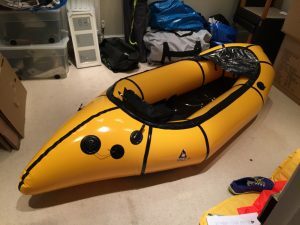 Past couple of years has seen a number of cheaper clones such as Nortik come to the market, while established kayak brands such as MRS have also brought out new inflatable versions of the classic Alpackaraft. When buying a packraft you need to consider your likely use. 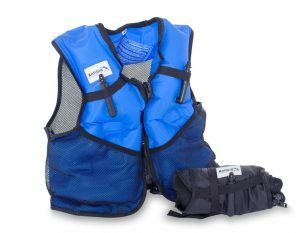 The smaller lighter rafts are fine for short crossings with minimal load, the multipurpose boats are solid all rounders and will cope with class 1-3 whitewater, though size/fit play an important part in handling your boat in moving water, with some people adding thigh straps for extra control. The Alpacka comes with two spray-deck options – a ‘cruising’ deck with is removable via a zip and velcro and a ‘white-water’ fixed deck which is more akin to a traditional kayak, requiring use of an accompanying skirt. The white-water skirt is the more water-tight but I preferred the flexibility of the cruiser deck. A packraft typically comes with an inflatable seat and backrest and a simple inflation bag that allows you to scoop up a bag of air and squeeze it into the raft. With a little practice you can inflate your raft within a few minutes – see my quick video below. 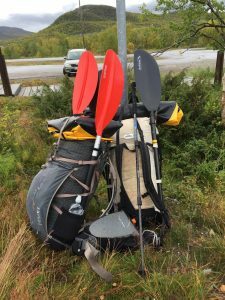 A typical packrafting paddle would be a 4-piece paddle, 210 cm in length and around 1kg in weight. Multi-part paddles are handy when carrying with a rucksack. A typical length of around 210 cm helps given the typically wide tubes on the side of the raft. Of course paddles are also a personal choice and as ever a compromise. Lighter paddles are more portable but will not be as robust or provide the necessary power in whitewater. 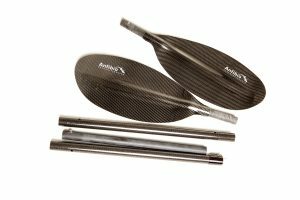 I used a cheap £20 4-piece alloy paddle with plastic blades for two years before upgrading to a 5-piece, adjustable Anfibio Ultimate paddle in carbon-fibre from packraftingstore-de. The difference was immediately obvious – the carbon paddle is much stiffer and the blade ‘catch’ in the water is so much smoother. Being adjustable the paddle can also be used a pole for my ‘mid’ shelter. I would always recommend a PFD (personal flotation device) when on the water. There’s a huge range available but you don’t need anything fancy, but you do need something that fits. Foam-based PFDs are cheap and robust though I opted for an inflatable Anfibio Buoy Boy PFD, again from packraftingstore-de. Its a little lighter than a traditional foam PFD but importantly for packrafting it’s a lot more packable and can even double as a pillow on multi-day trips. With the extra packrafting gear and weight you’ll likely need a larger rucksack. 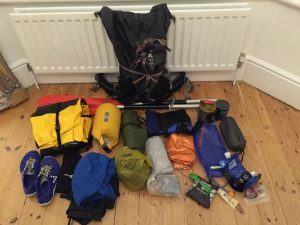 For our week-long Lapland trip I picked up an Exped Lightning 60 pack. At £110 and just over a kilo it carries suprisingly well but for Christmas I treated myself to a Hyperlight Mountain Gear Porter 4400 pack in cuben fibre, with the optional Stuff Pocket. The advantage of cuben fibre, part from being lightweight, is that it’s waterproof which is a big benefit when your pack is strapped to the bow of your packraft. Packraft carrying options vary – either inside the pack if its large enough (the packraft can be folded into a compact square), or carried under, or on top of the lid. 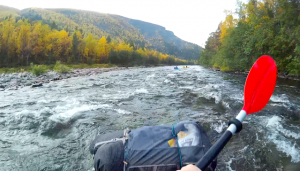 On the water your pack can be strapped to the front of the packraft – the added weight also helps stabilise and balance the raft with your own weight nearer the stern. Though you can use your hiking waterproofs you’ll likely want to add neoprene gloves and socks for extra warmth and make sure you have sufficient dry warm clothes to change into if necessary. If your planning on tackling white-water then a helmet would be sensible as well a standard safety gear such as a throw-bag and river-knife (a blunt-nosed knife is more suitable for an inflatable raft! ).